The School Yard Habitat program enables teachers and students to learn about the natural environment that exists at their own school site. An educator from Trees Indiana meets with students and teachers at least once a season to explore and discuss the plants and animals that live in their very own school yard. This is a three year program that seeks to train teachers to become their own school yard naturalist while learning along with the students. Teachers who participate in the program will become a Certified Urban Forestry Leader. This program is for all students and teachers, from early childhood through high school. Teacher commits to working with the Trees Indiana staff directly for two years and indirectly after that via a longitudinal study. 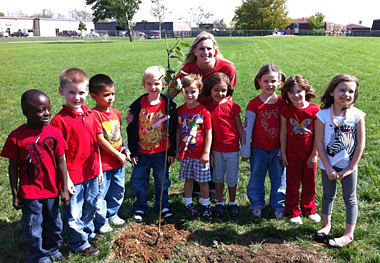 Trees Indiana staff provides a school yard habitat unit of study for the teacher. Teacher participates in the program as an observer the first year. The second year the teacher expands the first year lessons, co-teaching with a Trees Indiana staff member on-site. The third year, the teacher agrees to continue teaching the unit, but with only technical support from Trees Indiana. Teacher agrees to be part of a longitudinal study for ten years (by way of completing a survey and maintaining contact information). Teacher agrees to mentor at least one colleague in the use of a school yard habitat study. Teacher receives a copy of “Last Child in the Woods” for first year of participation and a commendation letter is sent to principal. Teacher receives professional development credit after the second year of participation. Teacher receives an Urban Forest Teacher Leader certificate from Trees Indiana after third year of participation.